I love making up sensory boxes and Small worlds. 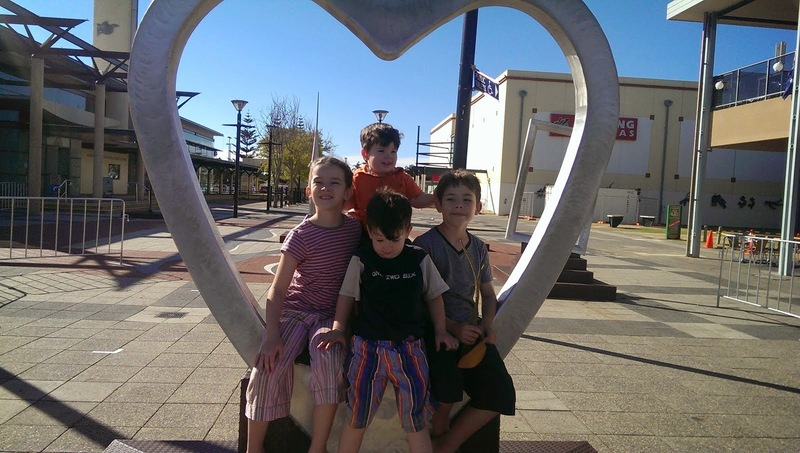 Sometimes I'm not sure who enjoys them more, me or the kids!! 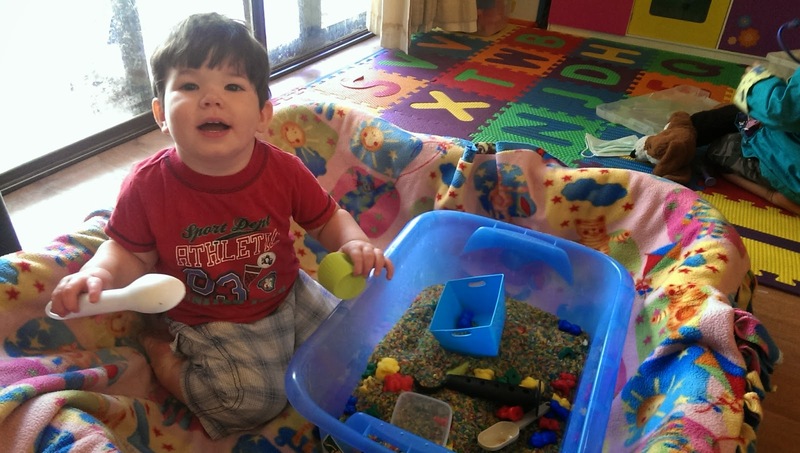 Nathanael loves the sensory aspect of the scooping and pouring and running his fingers through whatever the filler is, Samuel is really getting into the imaginative play aspect of the small worlds. 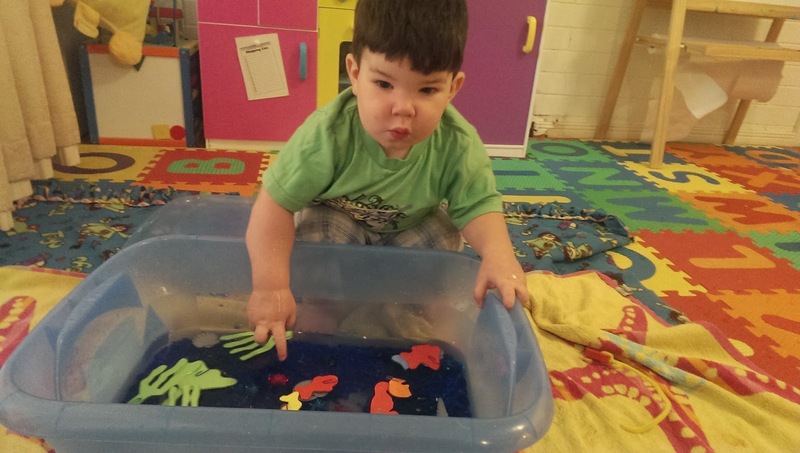 The big kids, who at 8 and 10 are of course too old for these now, can often be found setting up imaginary play or just scooping and pouring and enjoying the sensory aspects. Of course if questioned they are only doing it for their little brothers!!!! 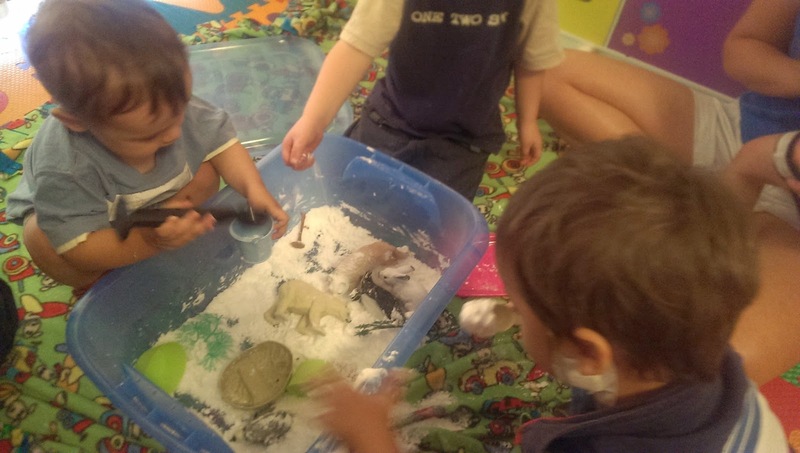 Sensory boxes are such and easy way to play. You can use almost anything you have on hand as a filler. 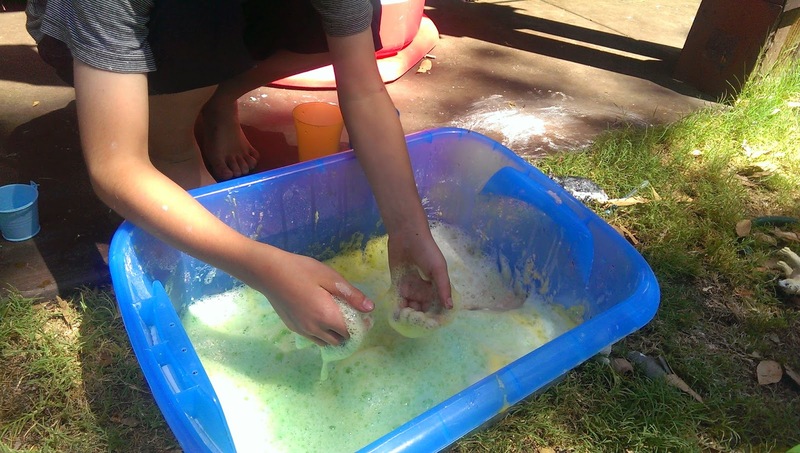 We have used coloured rice, pasta, beans, aquarium rocks, play sand, foam dough and water among many things. 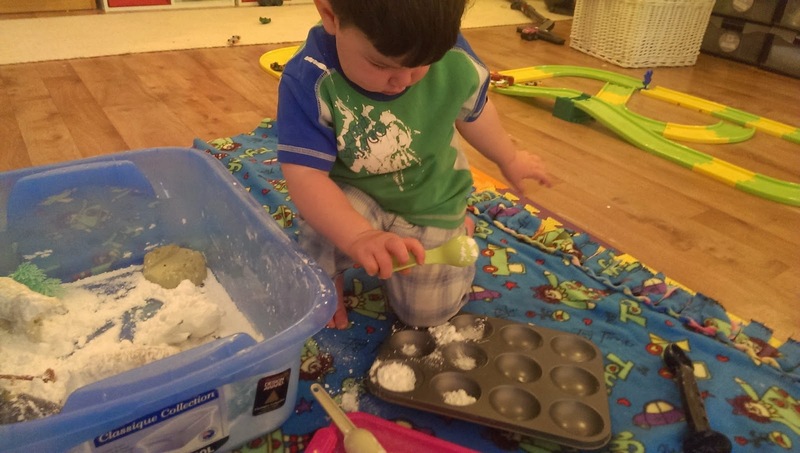 Then it can be as simple as adding in a few spoons and containers for scooping and pouring, or as complex as gathering matching toys and items to make a small world theme. 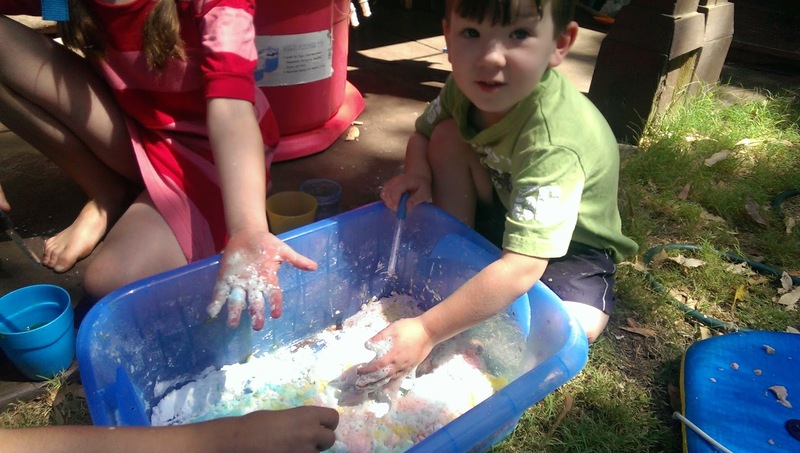 Sensory boxes have so many benefits. For example, the child's senses get a work out as they listen to the rice being poured into a tin, they feel it as they run their hands through the box. They can smell the different spice added to the mix. They also help develop, language, imaginative play and social skills as children act out stories and negotiate sharing of items in the box. 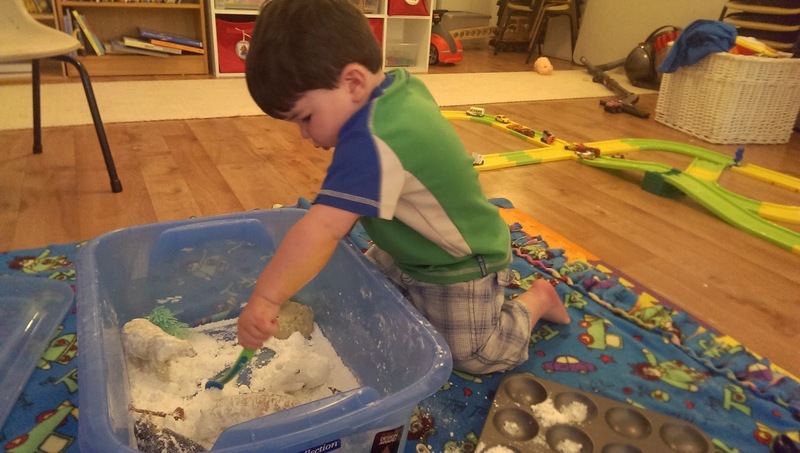 Fine motor skills get a work out as they manipulate the medium and tools of the day. Cognitive skills are developed as they learn about content related to the box which could be colours, shapes, name of animals, parts of plants and is only limited by your imagination. But are they messy, you ask? Absolutely!!! you will see in some of the photos below just how messy they can get. We usually set ours up on a big rug so any spillage can be tipped back in. The rules are: all mess must stay on the rug, no throwing, no dumping. If they can't follow the rules then the box gets packed away. Usually they are pretty good at keeping their tipping to the rug but anything that is accidentally spilled or trampled elsewhere can be easily vacuumed up when they are finished. 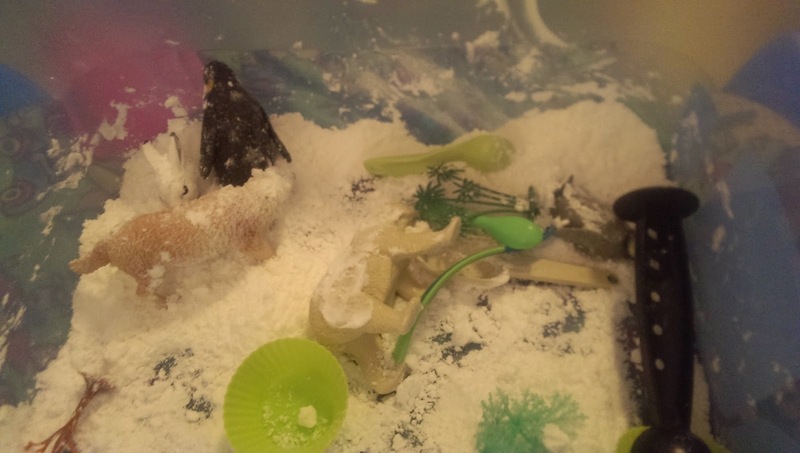 Here are a few of the sensory boxes we have used over the years. Some of our boxes are as simple as chucking some coloured rice, a few counting bears and some spoons into a box. Our Arctic box was made with cotton wool, sparkly pom-poms, gemstones and some arctic animals. For Autumn we used coloured pasta, little spikey seed pods, some orange glass stones, fabric leaves and lots of insects. This led to all sorts of imaginative play and sorting. Of course, I forgot to mention the baby always ends up in the box!! 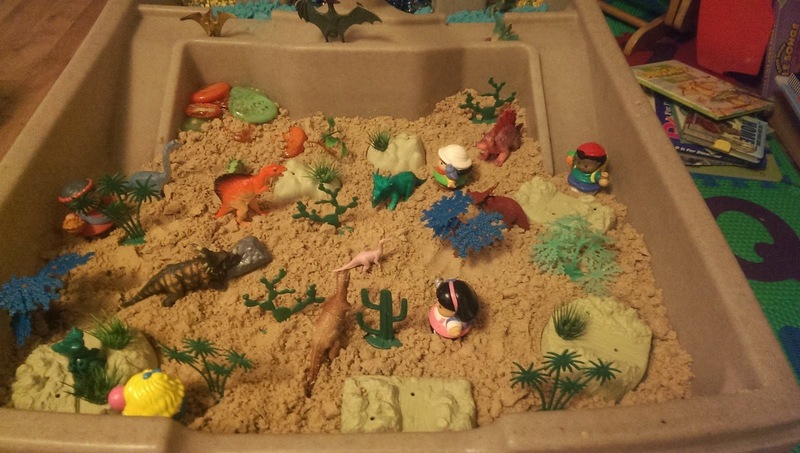 Dinosaur boxes are always a hit around here. This one was made using cloud dough which is simply flour and baby oil. It makes the softest, silkiest moldable and squishable dough and smells divine! 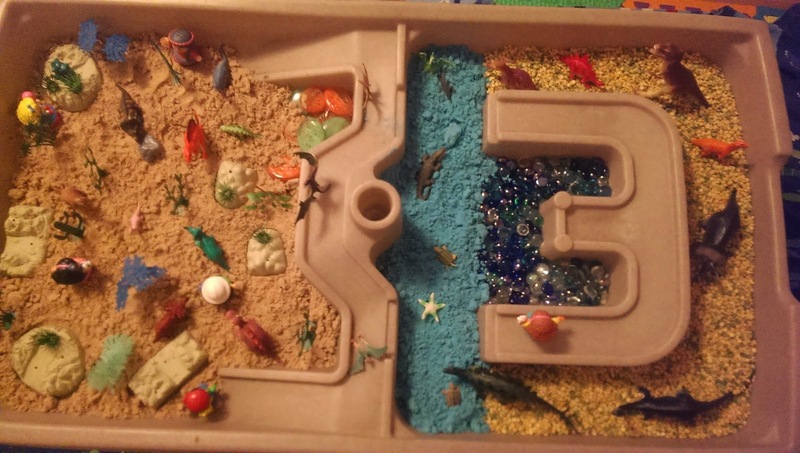 Add some food colouring to make land and water, throw in a few dinosaurs and other accessories and you're done. We make Easter boxes every year. 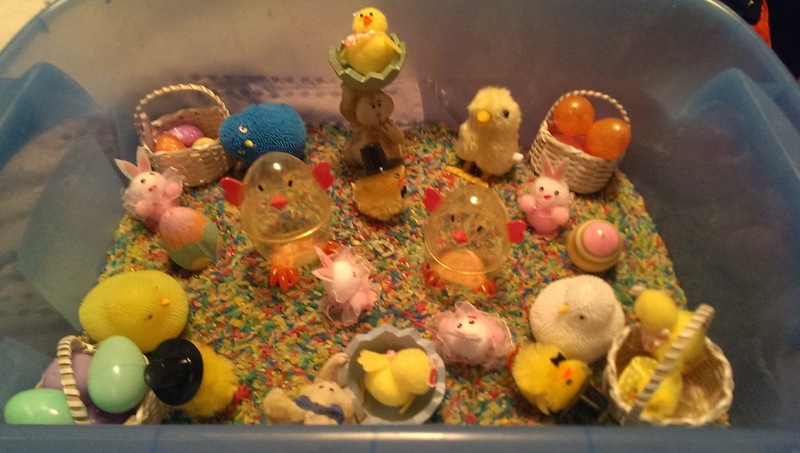 Sometimes they are filled with coloured rice, sometimes Easter grass and then whatever Eastery accessories we can find. 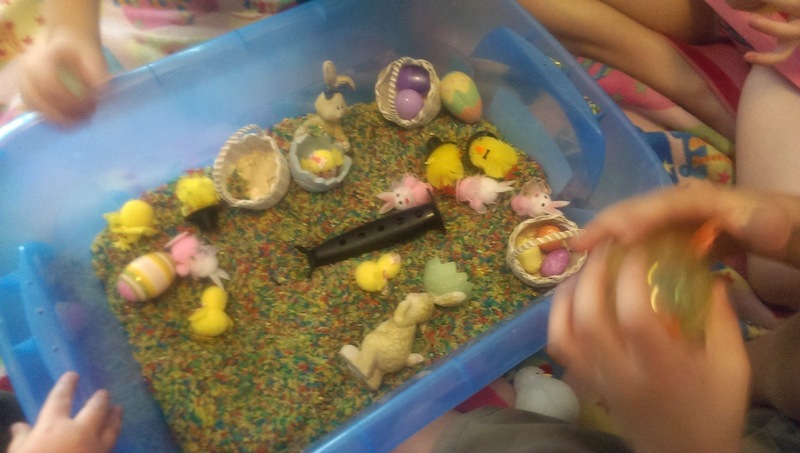 This farm box uses split peas as a filler and then a variety of farm animals and vehicles. You can see that the filler doesn't always stay contained but is mostly on the rug. Ocean boxes are always fun. Sometimes we add water, sometimes we leave them dry and just use aquarium stones and gems. Our snow box is made with Snow foam dough. Which is bicarb soda and shaving cream. This stuff is awesome!!!!! It moulds and crumbles like wet sand but is sooooo soft. 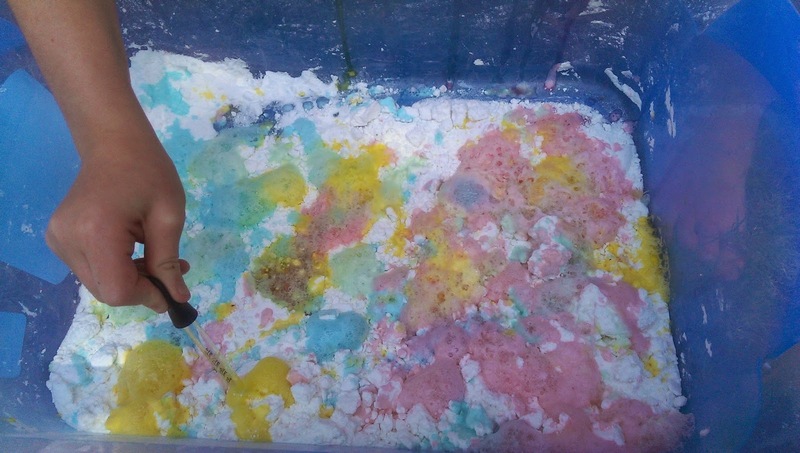 Once we were done playing with the animals in our snow box we removed them and I gave the kids some containers with vinegar and food colouring with some eye droppers and let them at it. They absolutely loved this. So, what are you waiting for? Go and make a sensory or small world box now! !